There had been occasion when I would decelerate to an intersection or junction and the engine would not settle to an even idle and remain rather ‘lumpy’. 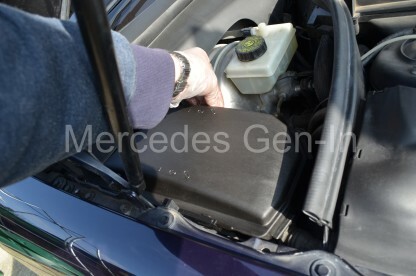 By tapping the pedal only slightly to raise the RPM’s by only the smallest amount resulted in the engine dropping back to its normal smooth idle. It was also noticed that when pulling away from a junction the accelerator pedal occasion required more travel to get the car moving than it normally would, and when it did begin to pick up speed it moved perhaps more swiftly than intended. 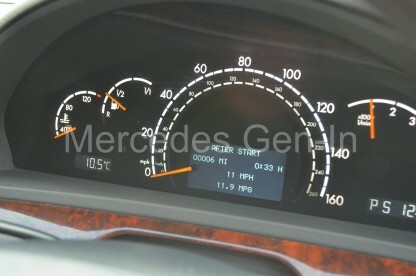 There were no reported engine codes and also nothing illuminated on the dash to indicate a problem. 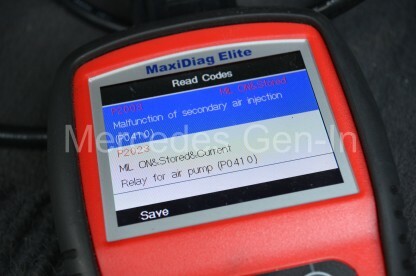 Asking around, a faulty throttle pedal position sensor was the confirmed as the most likely cause and the consensus of opinion was that they rarely ever caused a fault code to be registered, in fact one of my best contacts in the trade said that this condition directly pointed to the pedal issue, doubly confirmed by the fact that no code was reported. 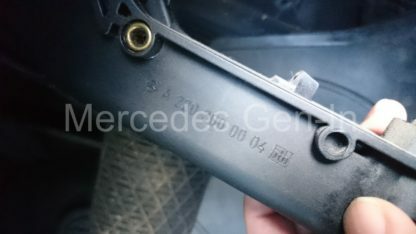 So I purchased a used part from a local breaker for £35 and fitted it in less than quarter of an hour from start to finish. 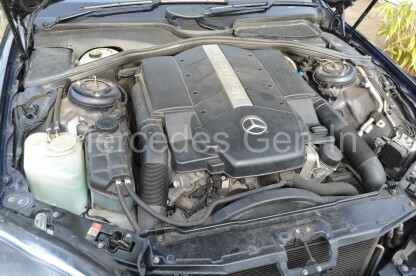 All that is involved is to remove the floor mats if fitted to gain unhindered access to the accelerator pedal. In the rear moulding there is a plastic circular bung about half way up the assembly, using a small screwdriver or pick lever this out. 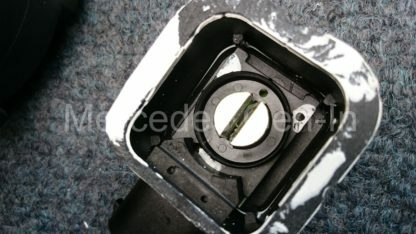 Beneath lies a recessed 10mm nut and washer, undo this with a small socket and extension. 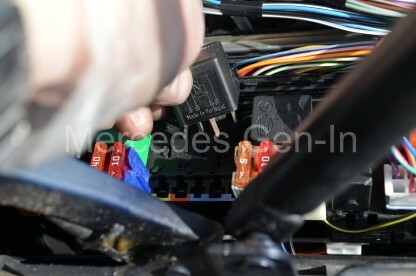 Now grasp the pedal and lift it upward from the bottom, levering it outwards slightly to clear the fixing stud, once clear, pull down to disconnect the pedal assembly from its top locator. 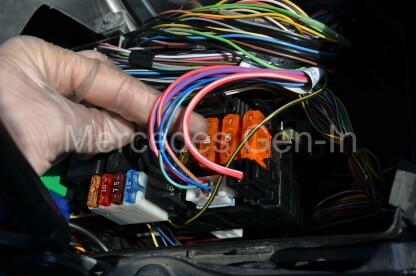 The pedal will now be free, retained only by two wiring/loom connectors. 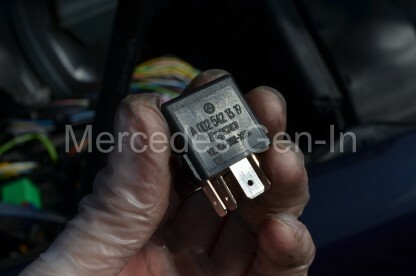 Disconnect the upper multiway plug to the position sensor model and remove the smaller two pin connector from the ‘kick-down’ switch from behind the pedal. Note how the kick-down wire is threaded along the side of the pedal assembly and remove it. 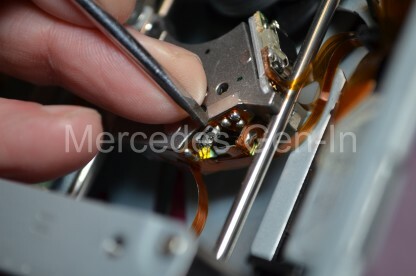 The pedal can now be replaced with the new unit, threading the thinner loom back in its correct position and then connecting both wiring connectors back onto their respective plugs. Feed in the pedal assembly, upper section first. 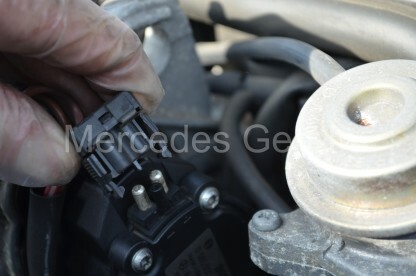 Once located correctly, swing down the pedal to mate with the fixed mounting stud and replace the fixing. Job done, all you then need to do is replace your mats and test the vehicle. 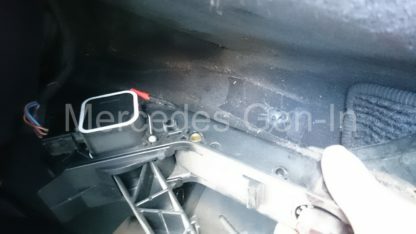 On the S500 (W220) there were two types of pedal assembly used, one with a part number A220 300 01 04 for the post face-lift version circa 2004 onward and part number A220 300 00 40 for the earlier model ranges to this point. 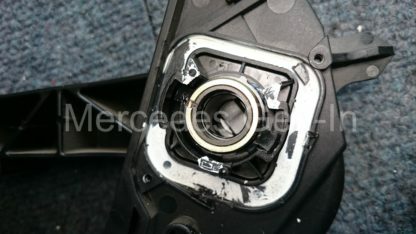 Its a good idea to remove your own pedal, as it is such a simple task, to check the part number of the item fitted before searching for a spare. 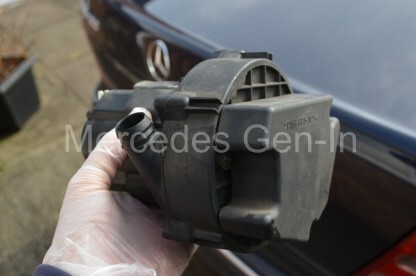 A new non Mercedes replacement should cost in the order of £150.00 and a genuine part closer to double that. A good used item should be in the range £35-£70 – the choice is yours! 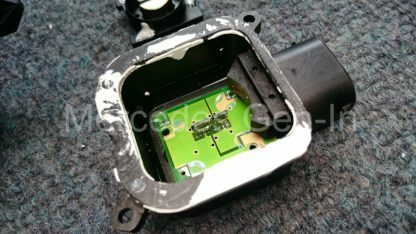 Interestingly there is a large number of people who still believe there is a potentiometer within the pedal assembly, this is of course not the case and the often read advice to spray switch cleaner on or around the sensor is largely futile. 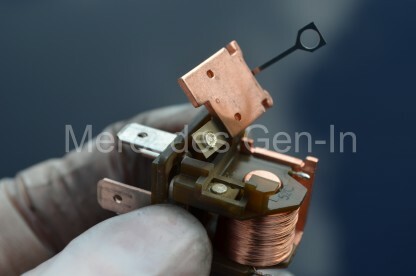 I have taken (broken) this unit apart so that you can see inside and confirm that in this case and most of the Mercedes models from about year 2000 on, this pedal assembly is all solid state and non serviceable. 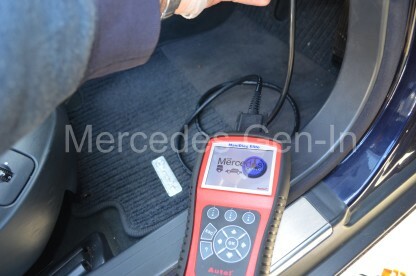 Each degree of throttle pedal rotation at the rotating hinge point, relates to a predetermined magnetic field strength and this is interpreted as positional data referenced back to the ECU. 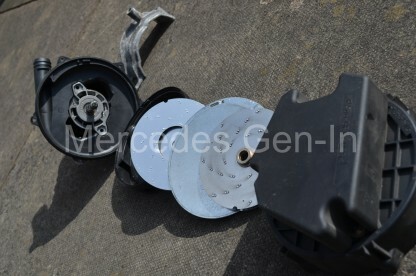 The older type of CD Changers fitted to vehicles that are ten to fifteen years young, if still in situ, are running on borrowed time. Complex electromechanical systems and solid state LASERs don’t have an infinite life and often replacing the unit with a more modern radio/cd or MP3 player is the best choice. 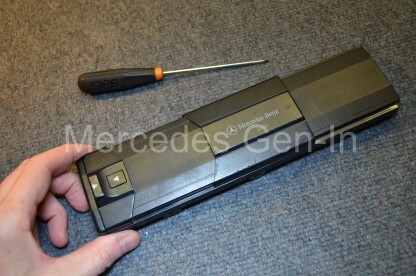 However for those of us with older integrated COMAND systems that use a dedicated cut out in the dash, it is not always practical to change the head unit to a more modern type without huge expense and if we want to play CDs the remote changer has to work as the slot up front is for the NAV disc only. 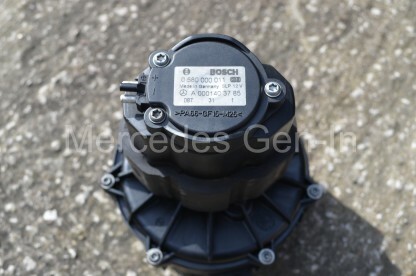 So what do we do then… The option is to source a used unit from a scrap car or breaker but it is most probably from the same era and will most likely be well on its way to end of life. So if you have an issue of ‘Magazine Empty’ or a badly skipping CD changer then there is a couple of last things to try before lifting the lid on the recycling bin and dropping it in! 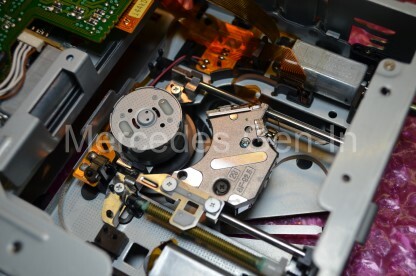 Obviously it goes without saying that it may just be dirt that is hampering the function of the CD player and in a few cases cleaning of the LASER lens will rectify the problem. 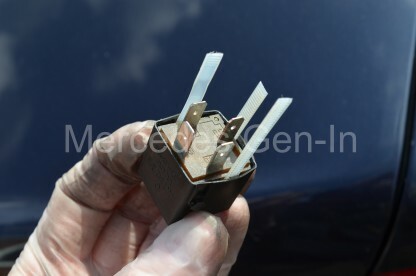 This is the thing to try first before making any electrical adjustment. You can use one of the specialist cleaning CDs you can buy with a fine brush attached to the playing surface. As this is drawn into the disc changer and played, the fine brushes gently sweep dirt and dust particles from the lens at very high speed. More stubborn dirt will have to be removed with the delicate use of a cotton bud and surgical alcohol. 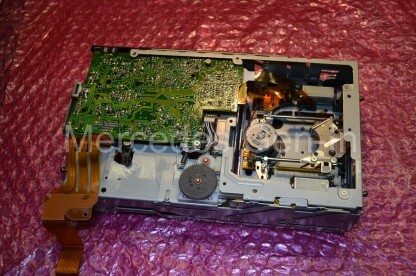 Assuming that you wish to proceed with trying to breathe a new lease of life into your old disc changer, and that you are not too bothered by the chance of failure – then read on. 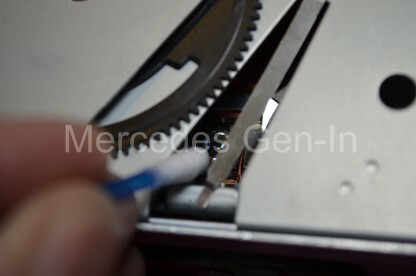 Eject the CD cartridge from the mechanism, disconnect the cables and orange DB2 fibre connection removing the player from its bracket in the car. Working on a table or bench, unscrew the four cross-head screws from the sides and three from the back of the unit case, two of these hold the fibre convertor. 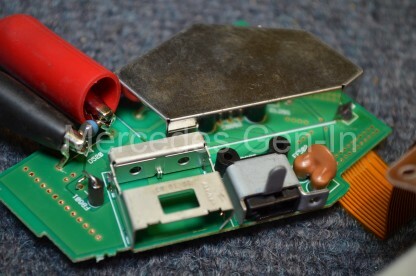 This then slots off sideways and the orange ribbon can be disconnected from the PCB connector by simply sliding out the white plastic anchor section about 2mm, releasing the foil from the PCB. Now completely lift off the cover. Unhook the spring loading mechanism from each side of the unit, noting the position of the levers before doing so. These are set depending on your player installation – either Horizontal or Vertical. 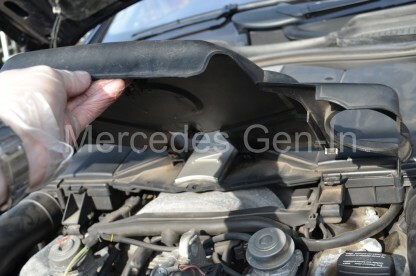 Now pull off the four ‘gel’ shock dampers from the retaining spikes on the inner chassis (2 on each side) and undo a single retaining philips screw on the connecting orange foil assembly. The inner chassis should now pull free from the base section. 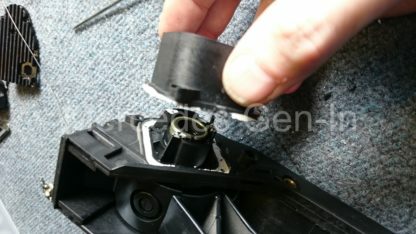 Identify the laser saddle and turn the lead-screw cogs with your finger to drive the LASER to the outer edge of the chassis, once in position turn over the player and you should be able to see the floating lens assembly through a gap in the mechanism top plate, there is enough room here to slide in a cotton bud and lightly brush the lens clean. Use alcohol if any deposits are stubborn or difficult to remove, dry thoroughly and polish off any residue lightly with a dry cotton bud. You may wish to try the player to gauge any improvement at this point, before moving on to the ‘last stand’ of adjusting the LASER current to get that last bit of life out of the player. 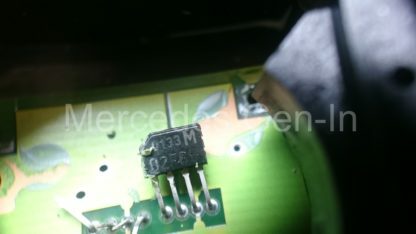 Go back to the lead-screw and run the LASER to its most inward position in the chassis and then look on the revealed vertical edge of the saddle and you should see a small ceramic trimmer or potentiometer, about 3 mm in diameter. This adjusts the LASER current. 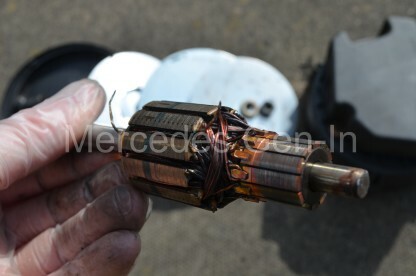 On Older wired and DB2 Mercedes and BMW, Alpine and Becker changers – current is increased by rotating this tiny trimmer anti-clockwise. It only needs to be moved by a small amount, as a small increment is often all that is needed to restore the player to a working state that may last for a good period of time, maybe year or even more depending on your luck! Remember the LASER is probably problematic anyway due to its age, so by increasing the current you are stressing it beyond its designed limits – but if you win a year or more use out of it before the inevitable replacement of the changer – whats to lose! 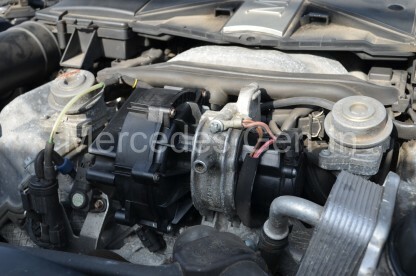 Rotate the trimmer about 30 degrees anticlockwise and rebuild the unit and test. More often than not this is all that is needed to get things running again. Good luck! 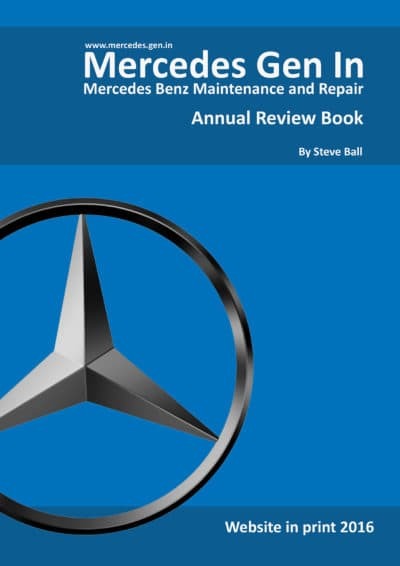 Remember this is not a repair, it is hopefully a ‘get-out-of-jail card’ used to squeeze the possibility of a little more operating time from a unit that is eventually going to fail. Usual disclaimers apply, you do this modification totally at your own risk under the full understanding that it may not work for you and that it could backfire and you end up junking your classic player.